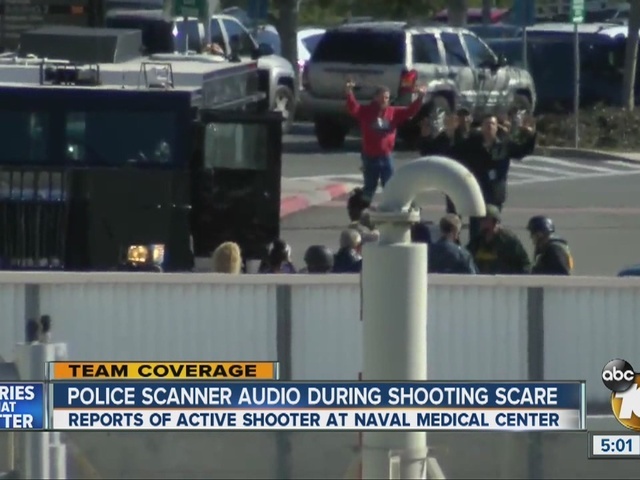 SAN DIEGO -- An apparently unfounded report of shots fired Tuesday morning at Naval Medical Center San Diego prompted lockdowns of the facility and nearby schools as law enforcement officers flooded the area and searched the hospital complex. About 8 a.m., authorities got word from a Department of Defense employee reporting what sounded like three gunshots seemingly coming from the basement of NMCSD Building 26, which houses a gymnasium and barracks, according to Navy Region Southwest. Military police with service dogs conducted an initial search, then turned to a more thorough floor-by-floor sweep. 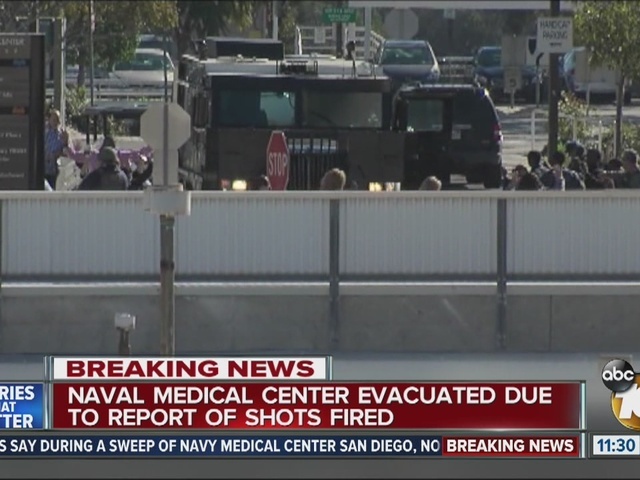 SWAT teams cleared buildings at the Balboa Park-area hospital, finding no evidence of a shooting or any other security hazard, according to Navy officials. 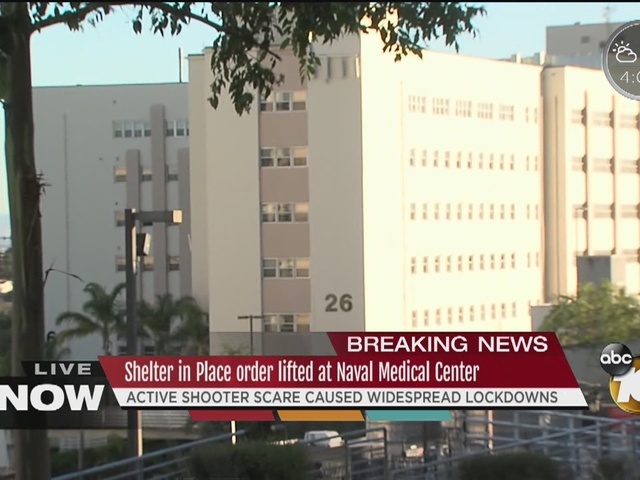 At about 3:30 p.m., Navy officials announced a shelter-in-place order was lifted "for the entire compound, including Building 26 ... Operations are going back to their normal cycles at the hospital as patient care and access to the NMCSD facility is resuming to business as usual. "We did an initial clearing of (Building 26) and found nothing that ... would indicate any kind of dangerous situation," Capt. Curt Jones, commanding officer of Naval Base San Diego, told reporters during a late-morning briefing. "But we are going back through, and now we're actually extracting people out of the building and ensuring that there is no threat." Officers also did sweeps of other parts of the medical complex as a precaution. Live news broadcasts showed people being led over the grounds of the facility with their hands in the air, apparently awaiting police searches for unauthorized weapons. "In an incident like this, it's not uncommon to get other pieces of information which suggest potentially a threat in a different area," the captain said. "We have gone and pursued every other piece of information to ensure that there is no threat or danger at any other location." Jones noted that construction activity was underway at the medical center Tuesday morning, though he said it was unclear if that work might have caused the noises that were reported as possible gunfire. No patients were evacuated during the emergency, said Capt. Jose Acosta, commanding officer of the hospital. Officials at the facility, commonly known as Balboa Hospital, initially urged those present to "run, hide or fight," as law enforcement officers swarmed the compound. Others, including non-emergency response personnel, were asked to stay away. Authorities at Naval Base San Diego said via Facebook people in the vicinity should shelter in place. "If in immediate danger, hide or seek shelter in secure space," the message stated. "Barricade the door and dial 911. Silence phones and other devices. Stay away from doors and windows. Remain calm and quiet." Registered Nurse Luz Florencio was one of many who wanted to get inside the hospital during the lockdown. "I'm still thinking about the patients that I'm going to miss," Florencio said about her patients, who are all Wounded Warriors. The nurse was stranded in Golden Hill Park overlooking the hospital while the complex was locked down. Florencio was late Tuesday because she had to drive her daughter to school. "I'm worried about my patients right now," she said as she clutched her phone. "I'm scared." One of her patients is a Marine who was shot in combat. "She is so scared so I said, 'You go out there, go out to the place that's safe,'" Florencio told the Marine on the phone during the early moments of the lockdown. Shortly after 9 a.m., Navy officials announced that the entire complex had been secured, including its childcare facilities, and that no one was being allowed to enter. All children were said to be accounted for and safe. Nearby Roosevelt Middle School, and Garfield and San Diego high schools were placed on lockdown as a precaution, according to the San Diego Unified School District. The campus security measures were all lifted within 90 minutes. Outside law enforcement agencies that have taken part in emergency drills with the hospital's staff in the past responded to Tuesday morning's crisis "on their own" and "very, very quickly," Jones said. Mayor Kevin Faulconer hailed the "tremendous collaboration" displayed during the emergency. "This is what we train for -- as a region, as a city," he said. "The fact (is) that we had, at last count, seven law enforcement agencies from the federal, the state, the local level that all pitched in, (that) didn't wait." San Diego police Chief Shelley Zimmerman echoed the mayor's praise of the response to the scare. "We're all grateful that it didn't turn out to be an active shooter, but if it had been, what you saw is we're very prepared as a region," Zimmerman said. 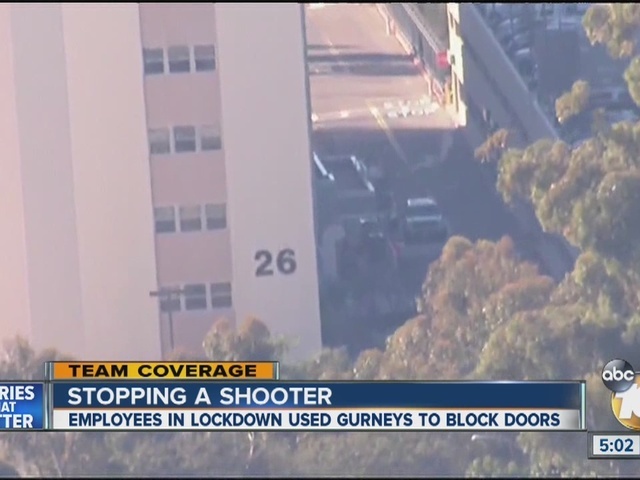 Former San Diego police SWAT commander Ray Shay viewed the lockdown and sweep of the hospital as textbook. "The goal was to find the shooter, stop him, and protect and save as many people as possible," Shay told 10News. 10News asked about improvements in the years since Shay headed up SWAT, and he replied, "Better communication, better equipment, but more than anything it's training and leadership and all those things were there today." He also reviewed a training exercise done a couple of years ago at the hospital, and he told 10News that he fully supports the idea of run, hide or fight. "One of the best things in the video is to encourage people to flee, secondly to barricade, try to prevent the shooter from coming in to where you are, and third and final is fight. People have to realize that when options are gone, you have to resort to improvised weapons: a stick, a fire extinguisher, anything to stop him," said Shay.